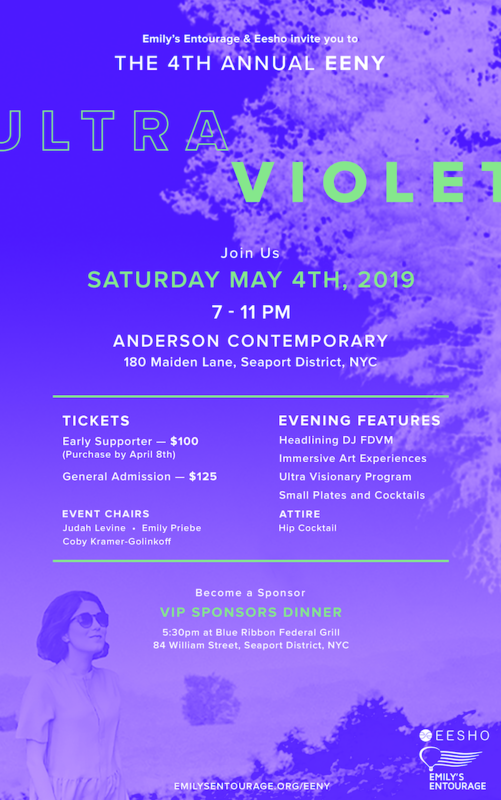 Join us for cocktails, small plates and an ultra violet experience at the 4th Annual EENY Gala. Due to the risks of cross infection exclusively among people with Cystic Fibrosis, we ask that nobody else with CF attend this event. We sincerely regret that we have to make this request, but it is in accordance with the infection control guidelines put forth by the Cystic Fibrosis Foundation. We look forward to the day that people with CF can be together without risk of cross infection. Until then, we thank you for your understanding in respecting this request. We ask that no one else with Cystic Fibrosis attend this event due to risks of cross infection, in accordance with infection control guidelines put forth by the Cystic Fibrosis Foundation. I have read and agree to the Terms and Conditions and give my consent to Emily's Entourage to process my personal data. I understand I can revoke this consent at any time. We are eternally grateful to our talented, endlessly passionate, and deeply committed Entourage, who make EENY and everything we do at Emily's Entourage possible. Meet the 2019 EENY Champions here! The EENY Champions Campaign recognizes and applauds young professional leaders helping to make a difference in the mission to cure CF. 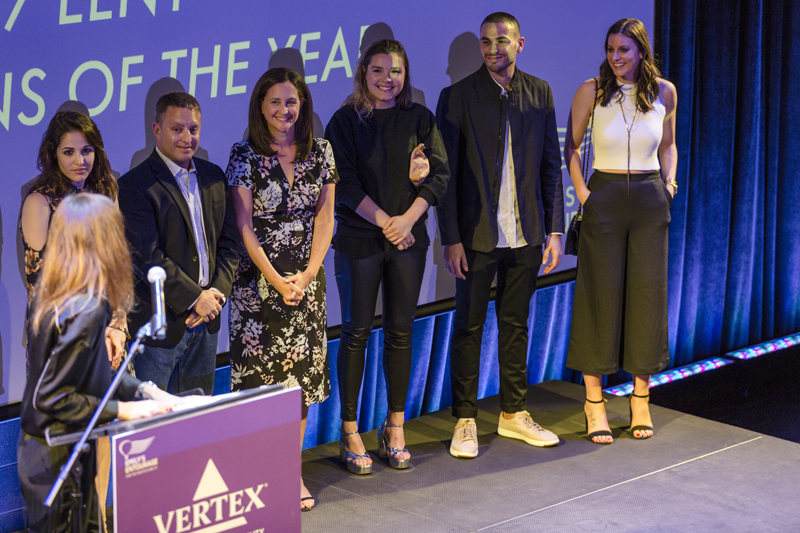 Nominated in recognition of their philanthropic spirit, the 2019 EENY Champions are asked to leverage their individual networks to meet a fundraising goal of $1,500 each by the 4th Annual EENY on May 4, 2019. At the event, the EENY Champions are recognized for their efforts and the top fundraiser goes home with the award for the 2019 EENY Champion-Of-The-Year! Champions sign up individually or as partners or teams. There have been husbands and wives, best friends and siblings as Champion teams. You can also partner with sports teams, sororities and fraternities, classes, companies, or co-workers to raise money as a group. Above all, being a Champion is about commitment to making a difference and the belief that changing the world is up to each one of us. For more information about the Champions Campaign, please email Admin@EmilysEntourage.org. View Current EENY 2019 Corporate Sponsors at the bottom of the page! The generous support of corporate sponsors is critical for making events like EENY successful and propelling life-saving breakthroughs for those with nonsense mutations of CF. Corporate sponsorships allow us to invest in promising research and drug development and cultivate high impact scientific collaborations with the singular goal of quickly translating therapeutic promise into reality for those with nonsense mutations of CF. We are thrilled to offer a variety of corporate sponsorships for EENY. To learn more, visit EmilysEntourage.org/EENY-Sponsor or contact us at Sponsorship@EmilysEntourage.org. 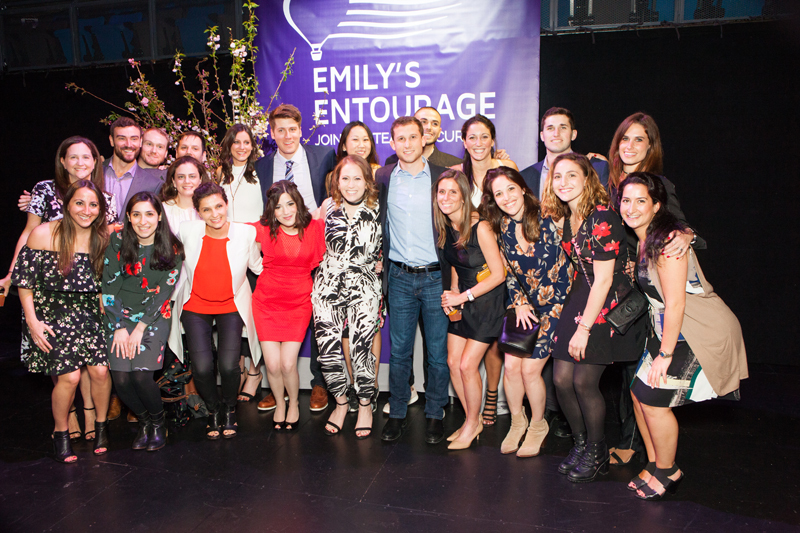 Emily's Entourage is an innovative 501(c)3 foundation that accelerates research for new treatments and a cure for nonsense mutations of Cystic Fibrosis, a fatal genetic disease afflicting Emily and many others. Named a Champion of Change for President Obama's Precision Medicine Initiative, Emily's Entourage has awarded over $3.5 million in research grants since 2011 and led worldwide efforts to drive high-impact research and drug development. Thank you to our individual sponsors whose support and commitment to Emily's Entourage fuels and propels our research and furthers our mission to cure Cystic Fibrosis!